These items are sold on a first come, first serve basis; and are subject to availability. Price is based on a cash transaction. For purchases over $300. Synchrony Bank has a 6-month deferred interest offer for individuals that qualify (additional fees may apply). Delivery available for a separate fee. 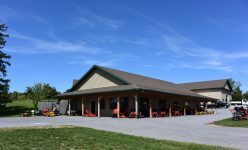 Items are tuned up and sold in good operational condition, unless otherwise specified (we’ll tell you about any known problems or if items are being sold as-is). Certain units are sold with a limited warranty (excluding blades, belts, tires, and battery); otherwise, there are no warranties, expressed or implied, on said equipment. If looking for something specific, give us a call. Our inventory changes regularly, and we don’t always have time to list them. John Deere 345 – 54″ cut – Hydraulic lift, Power Steering, Hydrostatic Trans, Steel cam installed in engine – 1268 hrs- $3,000. 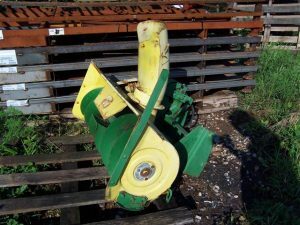 Dixon Zeeter 30″, 11hp B&S, hydrostatic trans – $1,000. Columbia GT2754KH 54″ 27hp Kohler Hydrostatic drive – includes 3-bag grass catcher – $1,200. Husqvarna GTH27V52LS 52″ 27hp B&S 437hrs Hydrostatic drive – $1,700. Simplicity Conquest 50″ 18 B&S Vanguard – Hydrostatic trans w/ differential lock – 88hrs – $2,800. Craftsman GT3000 Garden Tractor 50″ 23 Kohler Pro Hydrostatic Trans – $1,200. Walker 74″ mower deck. $1,999./OBO No discharge chute. 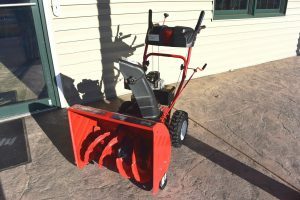 Troybilt Snowthrower – 2 stage 24″ 5.5 Tecumseh – $250. 1 older style John Deere snowthrower – came off a 212, but will fit some 100 series and 200 series – $300. 2 new Snowthrowers for Simplicity tractors available too!